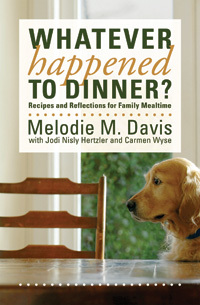 cooking, family, food, funnel cakes, how to plan a 60th birthday party, Whatever Happened to Dinner? This was a family tradition on holiday mornings when no other big activity was planned: my husband’s extended family used to have their Thanksgiving meal the evening before because of hunters in the family, and so we never had anything special to do on the big day. So funnel cakes for a late lazy breakfast were a fun tradition, or on other holidays like New Years Day, Memorial Day, Labor Day. You don’t want to do this when you have a lot of other big plans for your morning (like Christmas), because the biggest issue is cleaning up the rather grand mess you’ll make. 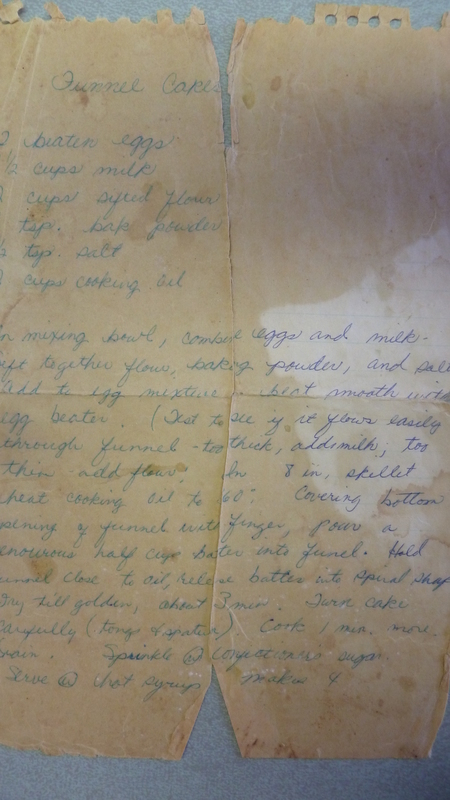 I found the recipe once in a magazine (sorry I didn’t write down the source) but my paper, as you can see, has now come apart (time to write it up fresh, but now it will at least be online). I Googled funnel cakes and there are of course a lot of recipes out there. My recipe does not use sugar (other than to sprinkle on top) or butter so that cuts the richness just a bit. And some of them talked about using a skimmer so I actually went out and bought one thinking it might make turning the funnel cakes a little easier, or at least lifting them up out of the hot grease. Meh, it worked only so so for this operation. Basically I use a long handled 2 prong fork and a tongs to turn them. But that’s definitely the hardest part, and if you make them with small children around, be OH SO CAREFUL with the hot grease. Don’t let them come near it. 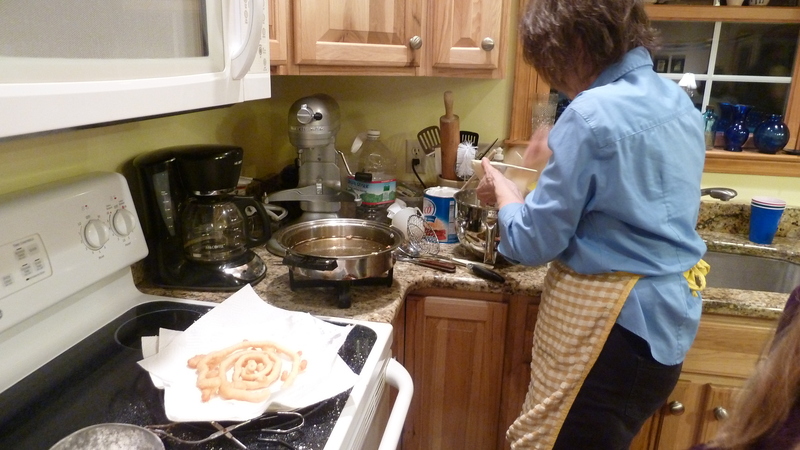 If they want to help, let them sift the powdered sugar over the cooked funnel cakes, which is fun too. In mixing bowl, combine eggs and milk. Sift together flour, baking powder, and salt. Add to egg mixture and meat smooth with egg beater or small mixer or by hand. Test batter to see if it flows easily through a funnel; if too thick, add milk; if too thin, add flour. In 8-inch skillet (or electric skillet) heat cooking oil to 360 degrees. (That’s why I use an electric skillet that has a temperature gauge on the control knob.) Covering bottom opening of funnel with finger, pour a generous half cup batter into funnel. 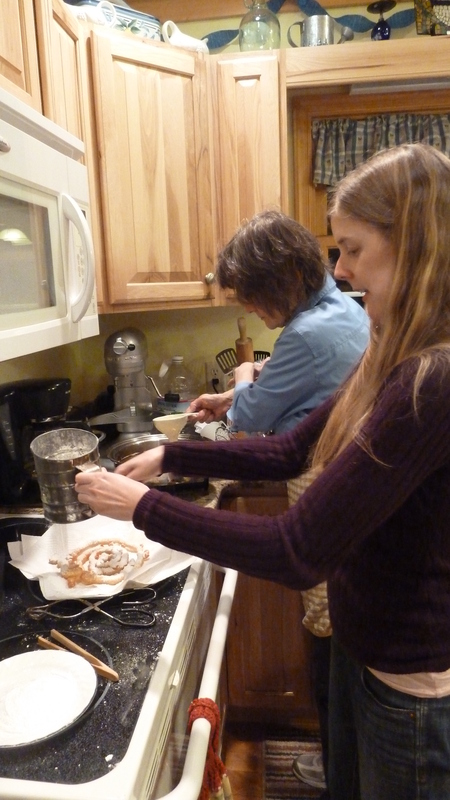 Top: spiral dough in skillet; me using fork to lift funnel cake; daughter sifting confectioner’s sugar. 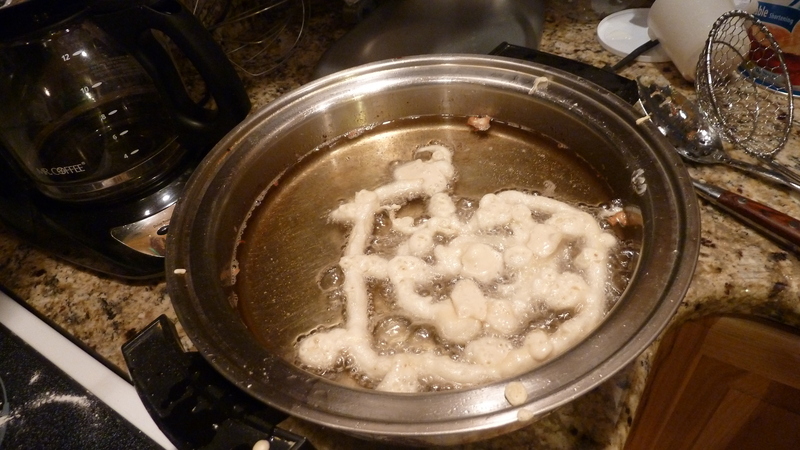 Hold funnel close to oil, release batter into spiral shape in pan. Fry till golden, about 3 minutes. Turn cake carefully (tongs and spatula). Cook 1 minute more. Drain on paper towel. Sprinkle with confectioner sugar using sifter, or with cinnamon sugar. Can also serve with hot syrup. 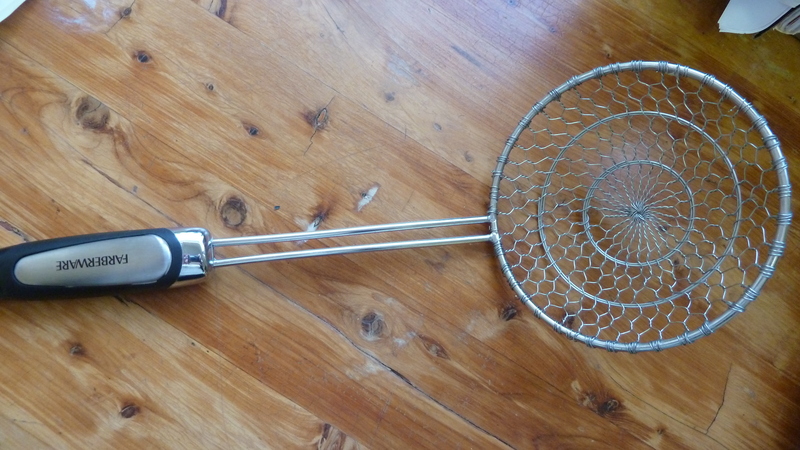 Makes 6-8 large funnel cakes, or more if you make them smaller. For the birthday party crowd, I doubled the recipe, and had batter left over, after making roughly 12-14. 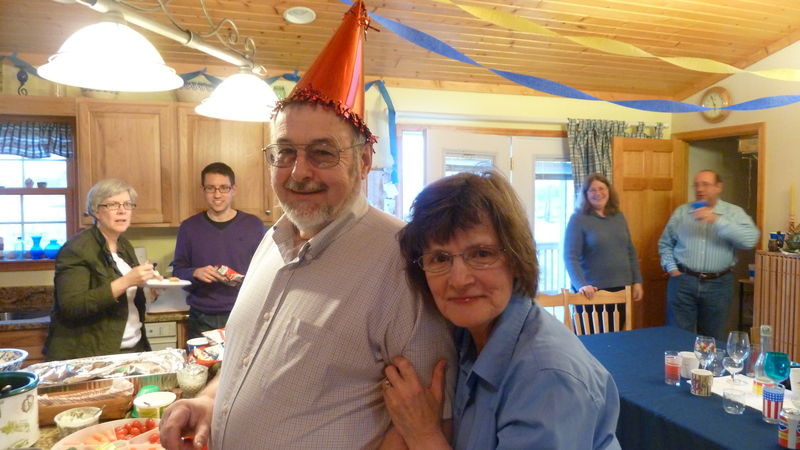 Here’s the birthday guy. And below, me with a grand mess. 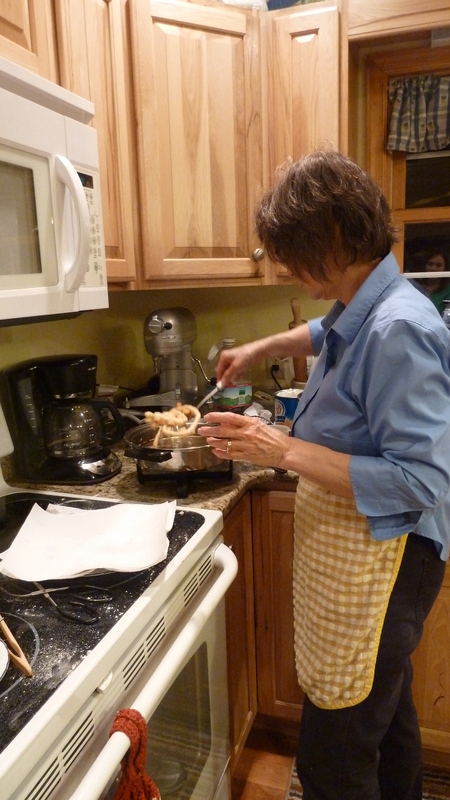 Do you have a special pastry or other “big mess” food that has become a family tradition? (Growing up, we’d make Cracker Jack once a year.) What else? I tried to make these not long ago and they didn’t look very pretty.